Buy your Pylontech Lithium 48 V 50 Ah battery at the best prices online.This battery offers a 10 year lifetime, with more than 4,000 cycles. This is with an average of 250 to 350 cycles per year. 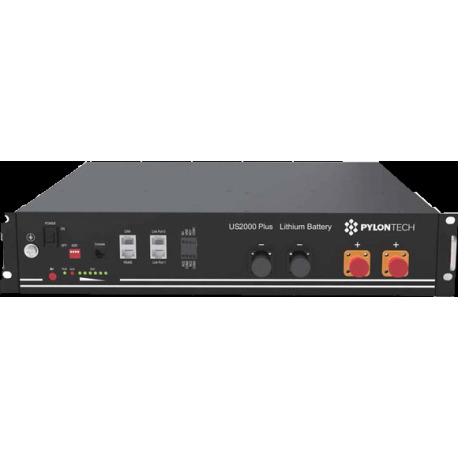 In addition, Lithium Pylontech batteries have up to an 80% discharge rate. Which gives you a far greater storage capacity than lead batteries. By connecting the lithium batteries to the SOLAX inverter you can check discharging and charging of the batteries on-line, free of charge. Lithium Battery: The Pylontech battery is lithium, and it only weights 28 kg which gives it a very good weight / electrical power ratio.It requires little maintenance. 4 000 Lifecycles: The Lithium Pylontech batteries easily increases the number of cycles versus lead batteries. You can radically increase the life of your batteries. Internet Monitoring: If you are not at home and you want to check that your solar batteries are working properly, there is nothing simpler with the Wifi internet supervision that is included via the Hybrid Solax SK-SU inverter.Data is sent free to the Solax servers. With the Smartphone application, you can check the real-time performance of your installation. The ideal personal solution for assessing the performance of your solar panels and batteries. 10 year lifespan: We estimate that the Lithium 50 battery has a lifespan of about 10 years (assuming 400 annual cycles, which is high).In fact, Pylontech batteries advanced technology mean they can get up to 4,000 cycles. This durability ensures the good performance of your system for the coming years. 2400 Wh Storage Capacity: To meet your energy needs, Pylontech batteries have a capacity of 2,400 Wh. This is equivalent to 2,400 W over a period of 1 hour. If this capacity is not enough, just add other batteries to your cart. The capacity is simply added on.